I attended a physician meeting tonight where I was told that 80-90% of physicians in one large vendor's base (large, wealthy, integrated care delivery systems) carry an iPhone or iTouch. That seems high, but I did get to share app screens with several other attendees. Alas, I didn't find any new apps. We all had fairly similar apps, or at we spanned similar app domains. The screen does have turnover. Today I finally gave up on Night Stand -- an app I once liked. I still like the idea but the product had become unstable. I also switched VoiceRecord (old app, never updated) for iTalk Lite for the same reason. Update 10/5/2009: In iTunes you can switch your Application view to "list" view, get a convenient list of all apps, and see when apps were last updated. 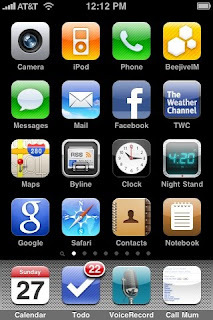 TUAW has a post on team member home screens and Firstand20 has the home screens for geek celebrity iPhoners. I'm most like "Brett" of TUAW, looks like I need to research "MindMeister" and "Cities". Seems like there ought to be a social graph application based on home screen overlap. See also: my standard iPhone configuration.